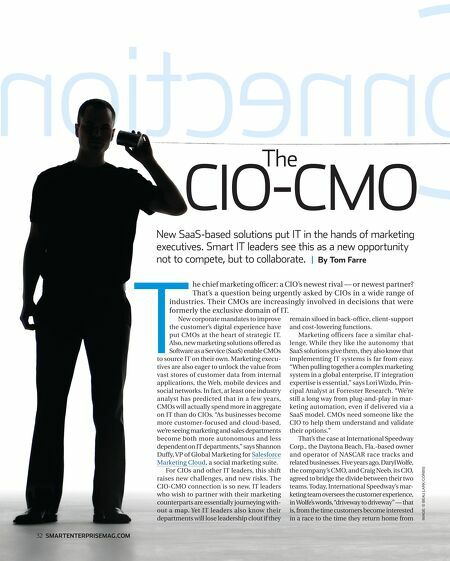 The CIO-CMO New SaaS-based solutions put IT in the hands of marketing executives. Smart IT leaders see this as a new opportunity not to compete, but to collaborate. | By Tom Farre New corporate mandates to improve the customer's digital experience have put CMOs at the heart of strategic IT. Also, new marketing solutions offered as Software as a Service (SaaS) enable CMOs to source IT on their own. Marketing executives are also eager to unlock the value from vast stores of customer data from internal applications, the Web, mobile devices and social networks. In fact, at least one industry analyst has predicted that in a few years, CMOs will actually spend more in aggregate on IT than do CIOs. "As businesses become more customer-focused and cloud-based, we're seeing marketing and sales departments become both more autonomous and less dependent on IT departments," says Shannon Duffy, VP of Global Marketing for Salesforce Marketing Cloud, a social marketing suite. For CIOs and other IT leaders, this shift raises new challenges, and new risks. 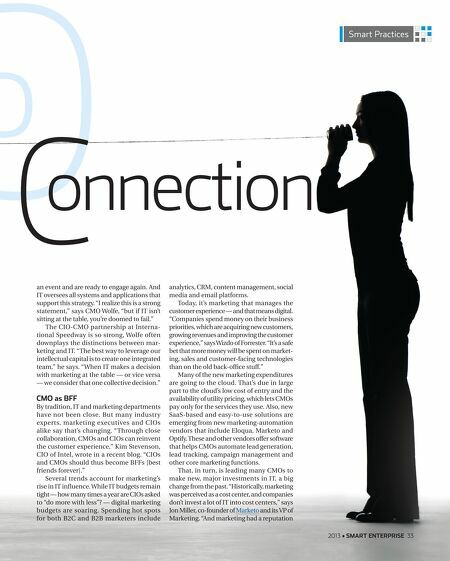 The CIO-CMO connection is so new, IT leaders who wish to partner with their marketing counterparts are essentially journeying without a map. Yet IT leaders also know their departments will lose leadership clout if they 32 smartenterprisemag.com remain siloed in back-office, client-support and cost-lowering functions. Marketing officers face a similar challenge. While they like the autonomy that SaaS solutions give them, they also know that implementing IT systems is far from easy. "When pulling together a complex marketing system in a global enterprise, IT integration expertise is essential," says Lori Wizdo, Principal Analyst at Forrester Research. "We're still a long way from plug-and-play in marketing automation, even if delivered via a SaaS model. CMOs need someone like the CIO to help them understand and validate their options." That's the case at International Speedway Corp., the Daytona Beach, Fla.-based owner and operator of NASCAR race tracks and related businesses. Five years ago, Daryl Wolfe, the company's CMO, and Craig Neeb, its CIO, agreed to bridge the divide between their two teams. Today, International Speedway's marketing team oversees the customer experience, in Wolfe's words, "driveway to driveway" — that is, from the time customers become interested in a race to the time they return home from IMAGE: © Beau Lark/Corbis he chief marketing officer: a CIO's newest rival — or newest partner? That's a question being urgently asked by CIOs in a wide range of industries. Their CMOs are increasingly involved in decisions that were formerly the exclusive domain of IT.